Cover with foil, and bake at 350 degrees for 45 minutes. Wow, this is incredibly simple and really tasty! 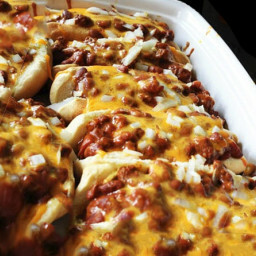 I could fit all 8 hot dogs into my casserole (9x13) and smothered them with chili and tons of cheese with excellent results! A quick to make staple, TY!.